Nepal Scouts hosted the Third SAF-Scout Friendship Camp from 21st - 28th April 2005 jointly organized by WOSM-Asia Pacific Region and funded by the South Asia Foundation (SAF). 422 young boys and girls, aged 12 - 26 years old, from Afghanistan, Bangladesh, Bhutan, the Maldives, Nepal, Pakistan, Sri Lanka took part in the camp. Afghan Scouts joined this event for the first time in 23 years. The camp was held in Nepal's popular high school, Budhanilkantha School, located eight kilometres north of Kathmandu, at the base of the Shivapuri Hills, which is located at an altitude of 2,400 meters. It was inaugurated by His Royal Highness Crown Prince Paras Bir Bikram Shah Dev accompanied by Her Royal Highness Crown Princess Himani Rajya Laxmi Devi Shah. Dr Rita Thapa, Chairperson of the South Asia Foundation Nepal made an address under the theme, "Scouting: Preparing together active and responsible citizens for South Asia”. The Chief Scout of Nepal and Minister for Education and Sports, Radha Krishna Mainali welcomed the participants. Chief Commissioner Sri Ram Lamichhanne said that the presence of Scouts from the SAARC area would help consolidate friendship and mutual relations amongst these countries. Participating Scouts went around the villages of Budhanilakantha, Kakani and Nuwakot and they made on-site studies of local specialties and resources, the state of education and health, and later shared their opinions on community development. They also spent a whole day in the Kakani Scout Centre, which is the National Training Center of Nepal Scouts. They did several educational activities: conversations with local villagers, planting trees, cultural exchanges and life skills. Workshops and seminars on various issues were part of the camp. The youth forum gave them the opportunity to discuss their discoveries and experiences that might change their outlook and give them new perspectives. 1. ‘Preparing Young People to be Leaders of Tomorrow’. A speaker gave a 30-minute talk, which showcased initiatives for preparing young people to be responsible citizens and leaders of tomorrow, through the Scout movement. 2. ‘What are the learning experiences that struck me most or that changed me as a person, during the Discoveries?’ Three young people were selected from the participants and each gave a ten-minute talk. They had learned that the people of Bhaktapur and Lalitpur are self-sufficient because they grow their own crops and make their own clothes. They mainly trade rice for radishes and maize. They had discovered and understood the humble situation of the local people of Kakani. What can we as Scouts do? Collect funds and provide free books and stationery; visit different places and conduct basic health awareness or immunization programmes for the local people; teach the people of Kakani some handicraft work and life skills which would help the jobless and motivate the people to work hard for their own needs and towards sustainable development. Organized Camps are to be held in Kakani at the National Training Centre. The participants and guests enjoyed a very colorful exhibition of arts and craft coming from the different countries of South Asia, these handicrafts were then sold to the guests who visited the camp. They also shared each other’s cultures by presenting songs and dances from their countries. 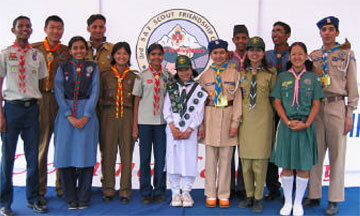 The objective of the Scout camp is to enhance mutual fraternity among young people of the South Asia Region. The organizers prepared several discoveries and the participants learned about Nepal’s rich and colorful cultural heritage, its unique and fascinating history and the lifestyle of its people. They appreciated the beautiful and eye-catching architecture in Bakthapur and Lalitpur. We would like to thank the UNESCO Goodwill Ambassador Madanjeet Singh for providing the financial resources for the travel of the overseas participants, to make the third SAF-Scout Friendship Camp a great success. We would also like to thank, last but not least, Dr. Rita Thapa, Chairperson of South Asia Foundation Nepal. We would like to acknowledge the Nepal Scouts for a job well-done. 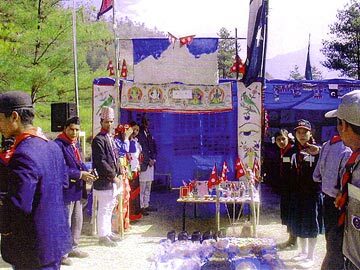 A Nepali exhibition stall showing handicrafts and other traditional artifacts at the First SAF-Scout Friendship Camp in Bhutan (21st - 26th February 2002).